Oppia is a genus of oppioid oribatid mites found in most parts of the world except Australia (Subías 2004). They are fungal feeders with masses of fungal spores having been found in the gut of O. nitens and O. neerlandica (Norton & Behan-Pelletier 2009). Characters (from Balogh & Balogh 1992): Prodorsum with costulae, lamellar and translamellar lines absent; interlamellar setae present; sensillus elongately fusiform or lanceolate. Notogaster without protruding humeral processes; crista absent. Genital plate with five pairs of setae. [CH98] Colloff, M. J., & R. B. Halliday. 1998. Oribatid Mites: A catalogue of Australian genera and species. CSIRO Publishing: Collingwood. [N77] Niedbała, W. 1977. Badania biocenotyczne nad mechowcami (Acari, Oribatei) Masywu Ślęży. Badania Fizjograficzne nad Polską Zachodnią, Seria C—Zoologia 30: 47–73. [S22] Schweizer, J. 1922. Beitrag zur Kenntnis der terrestrischen Milbenfauna der Schweiz. Verhandl. Naturf. Ges. Basel 33: 23–112, 4 pls. [S62] Seyd, E. L. 1962. The moss mites of Kinder Scout, Derbyshire (Acari: Oribatei). Journal of the Linnean Society of London, Zoology 44 (300): 585–591. [SN98] Swift, S. F., & R. A. Norton. 1998. 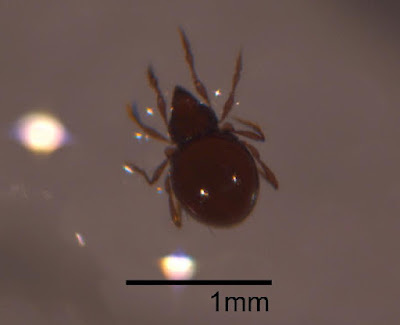 Preliminary report on oribatid mite (Acari: Oribatida) diversity in the Hawaiian Islands. Bishop Museum Occasional Papers 57: 1–44. Last updated: 22 December 2018.